A beautiful and extremely rare—I haven’t seen this photo anywhere else yet—panoramic view of Osaka from the Osaka Prefectural Office, looking towards the North East. 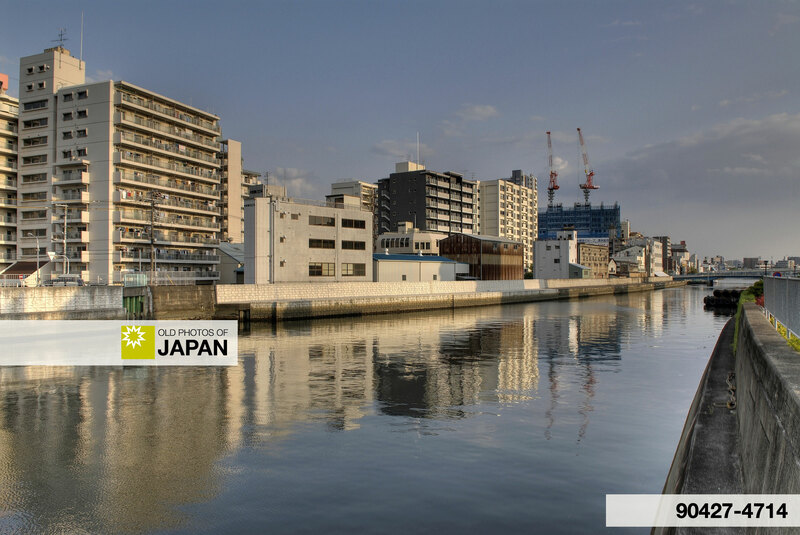 During the Meiji (1868-1912) and Taisho (1912-1926) periods, Osaka’s Prefectural Office was located on the small island of Enokojima, between the Kizugawa River and the Hyakkenbori Canal. 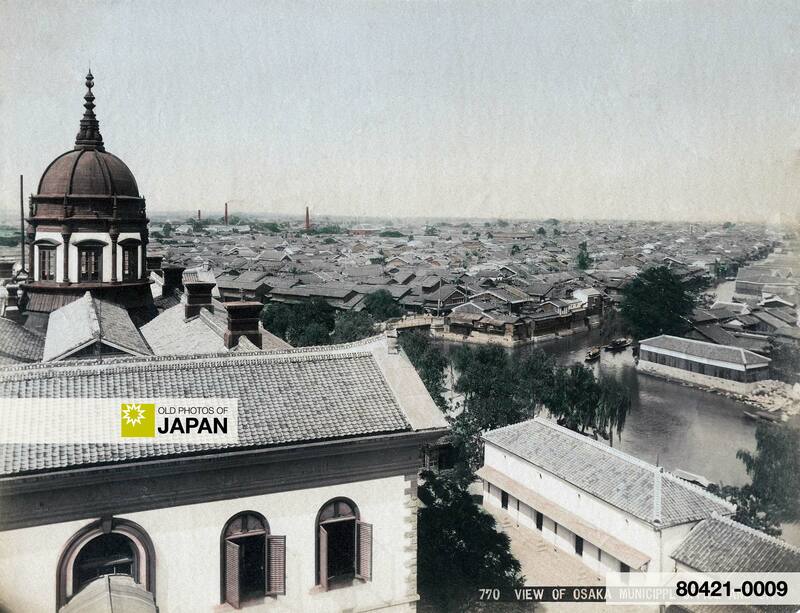 Completed in July 1874 (Meiji 7), the gorgeous Neo-Renaissance style building featured a dome on top. Next to the building stood a tall tower. The photographer somehow managed to lug his heavy and cumbersome equipment to the top level to preserve this incredible view of Edo-style Osaka for future generations. At the time this photo was taken, the industrialization of Osaka had barely begun and only a few chimneys can be seen on the city’s skyline. Soon there would be whole forests of them spewing out enormous clouds of smoke that perpetually hid the sky from view. But at this time the city is still pretty much as it was during the Edo Period (1603-1868), a mass of two and three-storied wooden houses and kura (white plastered storage houses) crammed along beautiful tree-lined canals and rivers that cut through the city at right angles. The large waterway in front is the Hyakkenbori Canal (百間堀). The two small boats are turning into the Kyomachibori Canal (京町堀). Both canals were filled in during the early 1950s and the area is now full of tall concrete buildings and asphalt roads. What is left over of the Kizugawa River has been lined with two meter high ferro-concrete walls. What once was a picturesque and clean river shaded by tall trees is now a dirty and polluted waterway hidden from view by cold concrete. The Kizugawa River today, as seen from around Matsushima Park, South of Enokojima. In 1926 (Taisho 15), the Prefectural Office moved to its current location in Otemae, Chuo-ku. The old Prefectural Office building was used as the Prefectural Industrial Promotion Office until it was destroyed by fire bombs during WWII. After the end of the war, the area was rebuilt and totally transformed. This photo is now the only reminder of what it used to look like. 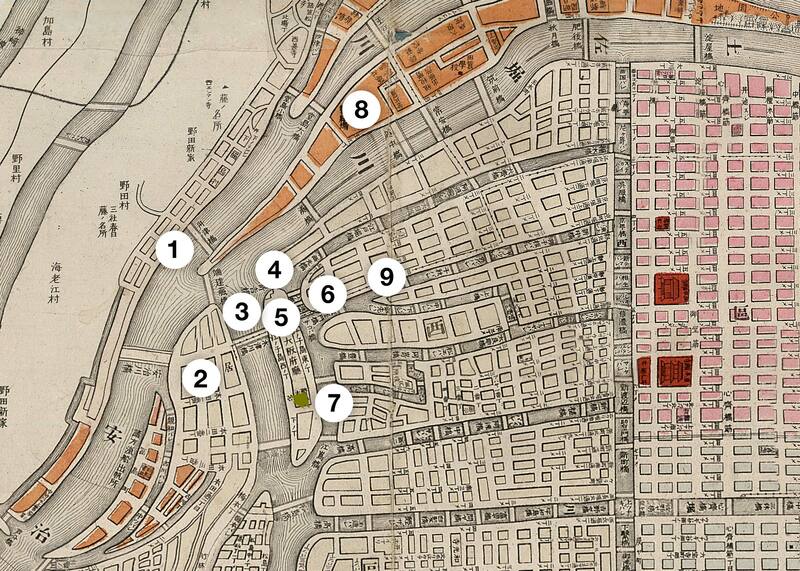 1889 (Meiji 22) Map of Osaka: 1. Funatsubashi Bridge on the Dojimagawa River; 2. Nakanoshima; 3. Kawaguchi Foreign Settlement; 4. Shinbashi Bridge (新橋) on the Kizugawa River; 5. Enokojima (江之子島); 6. Shitabashi Bridge (下橋); 7. Kyomachibori (京町堀); 8. Osaka Prefectural Office; 9. Hyakkenbori River (百間堀). You can also licence this image online: 80421-0009 @ MeijiShowa.com. vintage, precious and rare photos. Thanks for sharing. I would be happy to save these photos in my collection of rare photos…though it lacks photo touch up, it’s good as it is.